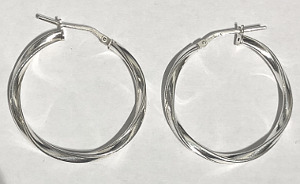 Silver Diamond Cut Hoops in pairs. 18mm Diamond Cut design Hoops. Sterling Silver round Hoop earrings - 18mm diameter. 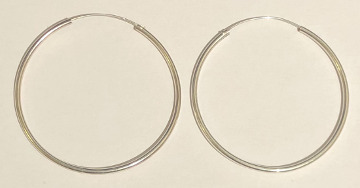 Classic Hoops sold in pairs. 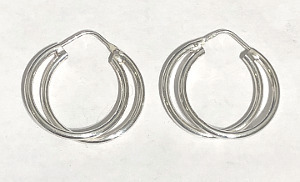 Sterling Silver Hoop tubular earrings. extra thick 4mm wide Hoops (pair). 35mm diameter 925 Hoops in thick 4mm gauge. Sterling Silver Cross design 925 Hoop earrings, 28mm diameter. 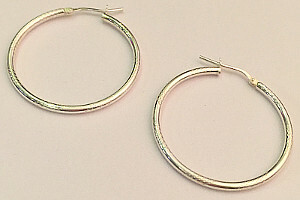 Large Size Sterling Silver SUPER HOOP TUBE EARRINGS. 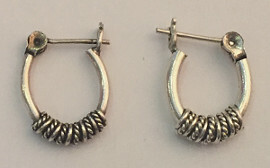 Excellent Sterling Silver Tubular Hoop Earrings. Extra Large 60mm Size. Sterling Silver 12mm Hoop earrings set with small Pink CZ Stone (pack of 6 Hoops). Sterling SILVER HOOPS with flat square edge finish. 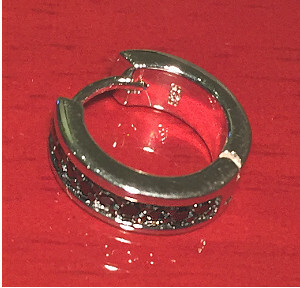 Large SILVER HOOPS flat finish edge. (per. pair) 12mm or 19mm size. Sterling Silver double Twist design Hoop Earrings, 29mm diameter elegant twisted hoops. Sterling Silver round Rope design Twist large Hoop earrings. Excellent twisted design 35mm diameter large 925 Hoops. Sterling Silver Flattened shape Round solid Heavy Hoop Earrings (pair). Solid Sterling 925 Silver, approx. 30mm diameter. Sterling Silver Hoop Earrings in flat square shaped style with rounded corners. Size approximately 25mm across. 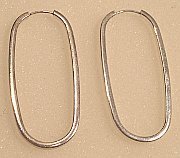 Pair of Flattened design hoops. Sterling Silver Wavy design Hoop Earrings, 35mm size (pair). Large Wavy design Sterling Silver 925 Hoop Earrings. Large size 55mm across (per. Pair). 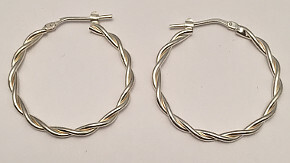 Sterling Silver Tubular Square design Large Hoop Earrings (pair). Wide hollow Tubular manufacture Square shape Hoops approx. 45mm size. 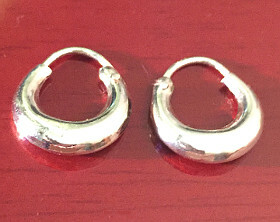 Extra Large Sterling Silver Hoop Earrings (pair). Massive sized 50mm diameter super Hoop 925 earrings. Popular Extra Large Hoops in tubular Sterling Silver design. 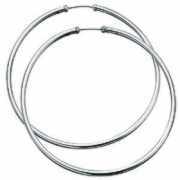 Sterling Silver tubular design Oval shaped Large Hoop Earrings (pair). Size approx. 50mm-70mm drop long Oval design, square hollow tube 925 Large Hoops. Sterling Silver 30mm large size Twist Rope design Elegant Look wide Classic Hoop Earrings (pair). Very thick Corrugated detailed design 14mm diameter Sterling Silver Hoop earrings (pair). Wide 8mm thick detailed designer hoops, with diameter of approx. 14mm. Hinged Sterling Silver Flowing design Hoop Earrings. Diameter approx. 16mm. Silver 925 Flow Hoop Earrings, thick 10mm wide Hinged Hoop design. 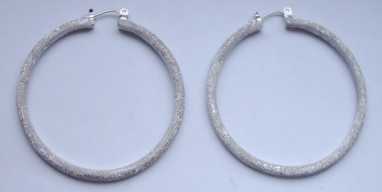 Sterling Silver Hoops with Diamond Cut pattern and polished Silver pattern (pair). Large polished 925 patterned hoops 34mm diameter. Sterling Silver 925 Extra Large 45mm Celtic design Hoop Earrings (pair). 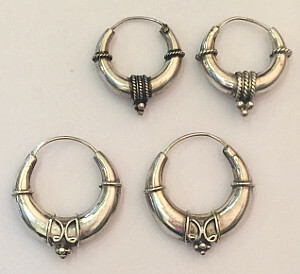 Large Bali Celtic style Hoops 5mm thick at widest point of design. Sterling Silver Single CELTIC design Hoop Earring. 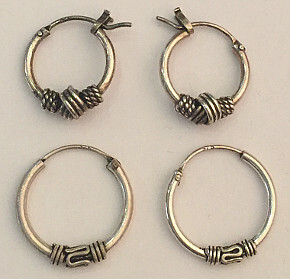 Assorted Bali Celtic type designs of Hoop in 925 Silver. Available in various different sizes. Designs may vary from example illustration. 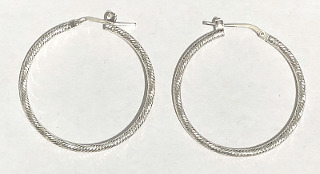 Sterling Silver Rope design finish Oval Hoop Earrings (pair) approx. 13mm. 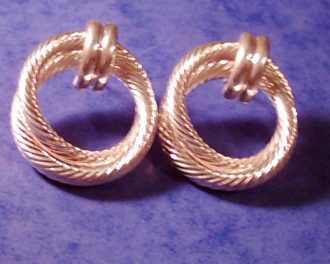 Sterling Silver Trio twists design Celtic Hoop earrings (pair) approx. 20mm diameter. Sterling Silver 925 Celtic design ladies Hoop Earrings (pair) 21mm diameter. Sterling Silver Hoop Earrings (pair) with Vintage Rope design. Round hoops approx. 16mm diameter. 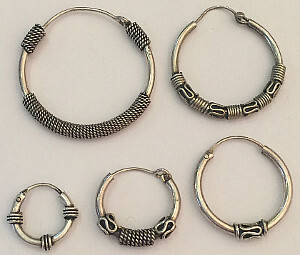 Sterling Silver wide Bali design Hoop Earrings (pair) in sizes 20mm/25mm/38mm. Sterling Silver Hammered design Oval shaped Hoop Earrings (pair). Elegant 33mm diameter ladies Hammer finish texture Hoops. Sterling Silver flattened design 21mm Hoop Earrings (pair). Available in Rose Gold finish or Sterling Silver finish. 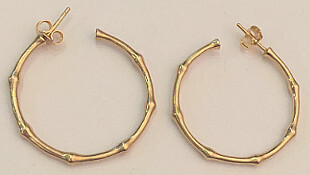 Gold on Sterling Silver Bamboo design 30mm wide ladies designer Hoop Earrings (pair). 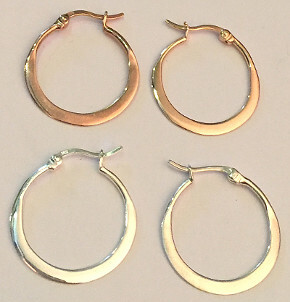 Stunning Bamboo style Hoops, including Gold on 925 Silver earring Scroll Backs. 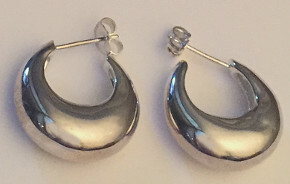 Sterling Silver Gypsy style Earrings, 14mm diameter (pair). 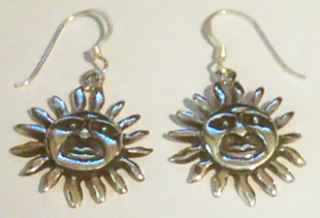 Sterling Silver Gypsy style Earrings, 20mm diameter with 925 scroll backs (pair). Unisex Sterling Silver CZ set hinged Hoop Earring. Unisex Large single Sterling Silver Hoop earring set with Black Stones. 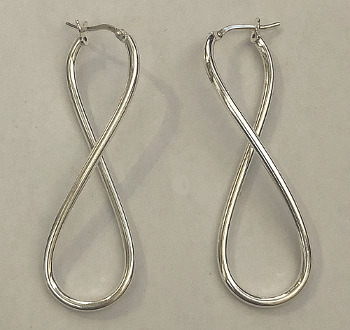 Sterling Silver designer twisted Figure of Eight Hoops, 50mm long (pair). Sterling Silver Hoop earrings with an Elegant simple Twist design. Approximately 30mm diameter pair of ladies elegant Hoops. Sterling Silver Double Hoop design ladies earrings. Pair of 26mm diameter elegant twin hoops. Sterling Silver Textured Diamond cut design round Hoop Earrings in 32mm diameter.